At the conclusion of Suits’ first season finale, "Dog Fight," Mike Ross’ career hangs in the balance. His friend Trevor, pissed about Mike’s relationship with his ex-girlfriend, Jenny, puts on his best suit and goes to Pearson Hardman to tell his boss Jessica the truth about Mike’s law credentials. I have a feeling that, if you were to screen the pilot for prospective viewers and poll them on what they expected from a first season finale, something along these lines would have been a common answer. Just as Hank Lawson was haunted by his firing, and Michael Westen was haunted by his burn notice, and Neal Caffrey was haunted by Kate’s disappearance, and Monk was haunted by Trudy’s murder, Mike Ross is haunted by the fact that he doesn’t actually have a law degree. It’s the central conceit of the show, the tension that drives the narrative action, and it’s the reason why Suits is more or less a stupid television show. Mind you, I think it’s a solid stupid television show, as weird as that phrase might be. 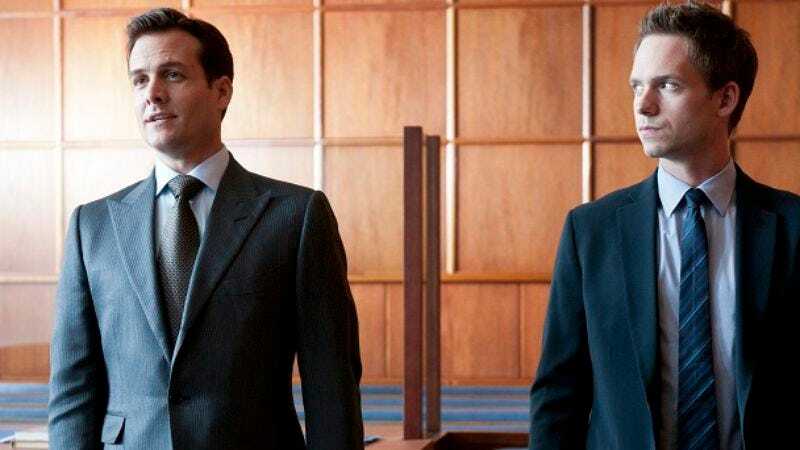 Every time I’ve suggested to people that Suits is kind of sort of worth watching, I get a skeptical response, and I’ll admit that it’s a half-hearted suggestion on a number of levels (as if the "kind of sort of" didn't tip you off). The procedural storylines have been contrived, either trying too hard to create parallels to Mike’s situation or simply pushing the boundaries of credulity, and the show has been held hostage by its very premise. All of the hauntings listed above (which, in case you don’t recognize the names, all come from USA series) created tension that either helped form the procedural foundation of the series or created a self-sufficient serialized element. The kind of cases that Michael Westen took were shaped by his burn notice, while Monk’s trauma regarding Trudy’s death forced him to serve as a consultant rather than as a detective; meanwhile, Neal Caffrey’s search for Kate was a distraction and a point of conflict with Peter, but it was not inherently part of the “Con stands for Consultant” premise and could co-exist with it quite naturally. These shows could, if they so desired, move past the initial premise quickly and redefine the show (as White Collar did when they exploded Kate and moved onto a new ongoing serial element), but they could also allow the premise to play out over time—they should really rename the show Slow Burn Notice, amirite?—without damaging the week-to-week storytelling rhythms. 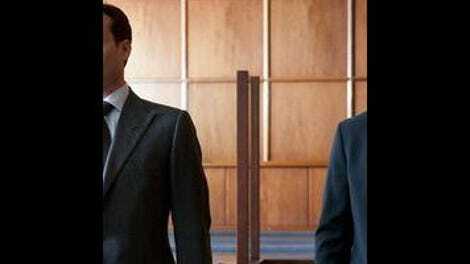 By comparison, Suits has no escape route and has a premise that could fall apart at any given moment. The show is basically a Rookie/Mentor scenario, with Mike Ross as the young associate and Harvey Spector as the seasoned senior partner, but it’s as though they are performing these roles while hanging over a tank with a shark, an alligator, and a lion in it. Mike does the job of a junior associate and faces the same challenges of a crippling workload and neurotic superiors that any other junior associate would face, but at every turn is the reminder that anyone learning his secret would tear apart the very fabric of life itself. Instead of shaping the narrative form of the series, the fact that Mike doesn’t have a law degree threatens the narrative form of the series. Tonight's episode, “Dog Fight,” is a solid finale to a show about lawyers. Yes, I have my quibbles with the show’s procedural storytelling that I've had throughout the series, with a few weakly constructed bit players (like the cop) calling attention to the contrived nature of Harvey’s legal rollercoaster, but Chi McBride was able to bring a bit more nuance to his D.A. figure, and I was glad to finally see Harvey spend some considerable time in a courtroom (which I sort of think is a budget issue as much as a creative one). It was also important to see a story about Harvey, even if his sudden obsession with this case was a bit, well, sudden; the character has been in the background for most of the season, so his emergence here was a nice counterpoint to Mike’s love triangle drama, and the episode did a decent job of framing his vigilante methods relative to his desire to undo a past wrong. However, when we eventually got to that cliffhanger, I couldn’t help but wish they could have reconsidered the premise. Wouldn’t this show have been better if Mike had a law degree but simply got caught up in a bad situation from which he needed to be rescued? He could still struggle with leaving behind the friend who nearly got him arrested, and he could still share a complicated relationship with Rachel (given her experience weighed against his seniority), and he could still look up to Harvey for giving him a second chance. This episode could still function in exactly the same way, featuring almost exactly the same scenes, but there wouldn’t be this black cloud hanging over things where there would be no show if the cliffhanger went forward as it is suggested. The stakes might be lower, perhaps, but they would also be more reasonable, which would allow the show to focus on what it does best. What the show does best is Donna, perhaps my favorite character of the summer. Harvey’s whipsmart, no-nonsense assistant, played by Sarah Rafferty, Donna has chemistry with every other character; in “Dog Fight,” she even draws some new personality out of Rachel, who has been problematically defined almost exclusively by her relationship with Mike. In this episode alone, she has a tense confrontation with Harvey that reflects on their long-term relationship, an awkward (but funny) conversation with Louis which reflects on her wiles (which are not solely stereotypically feminine), and that moment with Rachel where she reflects back on why her relationship with Harvey never became anything more than professional. Rafferty is hilarious without seeming too broad, and Donna is a funny character, grounded by her relationships to the people around her. When Mike thinks he needs help, Donna toys with him; when Mike actually needs help, Donna is there to help him weather the storm. Yes, on some level, I think they should entirely reorganize the show and make it about Donna, expanding the assistant pool and getting rid of the whole “law” side of things outside of what we see through the assistants' eyes, but you can sense the show already sort of wants to do that. Given how much time they spend outside of the courtroom, with Harvey’s prowess measured in part by how often he avoids it entirely, this is really a workplace drama (or dramedy, if you prefer), and you can see the writers leaning more heavily on that particular genre. The problem is that they didn’t seem prepared for it, and the engine of the show (its procedural storylines) hasn’t been designed in order to take advantage of it. I like Harvey and Louis’ rivalry in theory, but the show’s attempts to play it out within legal storylines have been borderline obnoxious at times, to the point where you can almost hear the writers brainstorming on wacky legal situations that might require two lawyers from the same firm to compete against one another. Although I’ve already suggested two dramatic interventions, either giving Mike a law degree or making Donna the star of the show, the fact is that we can’t go back in time and change the formula we’ve been given. However, I would argue that we could go forward in time. The best thing the show could do right now is flash forward and follow Mike as he returns to Pearson Hardman after being given the opportunity to get his law degree, now forced to adjust to the firm all over again. It would give the show a chance to reorganize itself and flesh out the relationships between characters by giving them an immediate sense of history. It would also allow those relationships to be built on facts instead of lies, knowledge instead of ignorance, which would keep the show from circling back around to Mike’s lack of a law degree like clockwork in each episode. This premise may have been an interesting way to meet these characters, and I think it worked well for Mike in the beginning of the season, but it’s a repetitive and destructive idea for a long-running television show, and some part of me hopes that Aaron Korsh realizes that. What’s interesting about Suits is that there’s a (slight) chance it could be a very different show when it returns next year. Korsh, who created the show and scripted tonight’s finale, has been serving in a non-showrunning capacity, due to a lack of experience, but USA is giving him the reins in the second season. It’s quite possible that the parts of the show that work best are what Korsh was most interested in and that the law degree/procedural framework were training wheels that he might be able to work past in a second season. If this happens, I think there’s a solid show here. Patrick J. Adams is a charming lead, and his chemistry with Gabriel Macht has led to a dynamic that definitely owes something to Tim DeKay and Matthew Bomer on White Collar (even if it took a while to develop). Similarly, Gina Torres is a great actress who has been strong when called upon (and should be called upon more often), and despite some attempts at turning the character into either a complete idiot or a complete villain, I think Rick Hoffman’s Louis could be a real asset if ironed out a bit. Within any individual episode or scene, you can see where these parts could become a compelling whole, but they’ve rarely (if ever) come together successfully. If you were to reimagine the show around those moments, building a narrative structure around it, there are enough likeable qualities here for me to stick around. Suits will not be reimagined. Sure, it might change slightly, but the USA formula has become so ubiquitous that Suits moving away from it seems nigh impossible. Whatever the hook is to get viewers in the door and no matter what characters may populate that world, the follow-through is always going to be a combination of basic procedural storylines mixed with an overarching serial element that provides tension and will eventually prove a substantial component of season-ending clifhangers. It seems almost cruel, but Suits is problematic in part because its hook was actually among the most interesting hooks for USA shows (especially compared to shows without clear hooks like Fairly Legal or Necessary Roughness), but it is, thus, the most unsustainable within the USA model. It’s a show built to succeed, airing in a context where it will never fulfill its potential, a germ of an idea that has become haunted by the very ambition that spawned it. The grade above is for the season as opposed to the finale. I’d say "Dog Fight" grabs a B-. So, what happened to Mike’s grandmother? The show is not doing a particularly terrible job at pretending it isn’t shot in Canada, but I’m always entertained when I follow the IMDB trail and find guest actors with nothing but Canadian credits. In regards to the Rachel and Jenny love triangle, the show hasn’t done enough to make either female character complex enough to create any investment. I understand they only have so much time, but we need to see more of Rachel doing things unrelated to Mike (especially given Meghan Markle is a series regular). Either way, though, the show fails the Bechdel Test in a major way. Definitely thought episode seven, “Play the Man,” was the season’s strong point. Little focus on Mike’s fake law degree, good focus on the workplace through the whole mock trial, and the first storyline where Harvey seemed like a real human being. The show never really found its stride otherwise, at least for me.